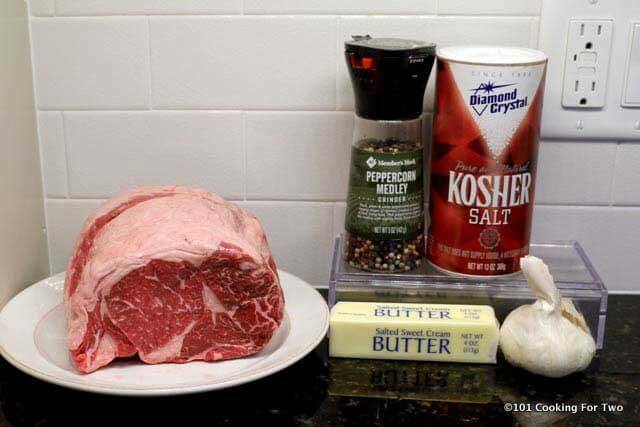 Easy step by step instructions for a wonderful small ribeye roast. Cut down for the smaller household. This roast will not leave you eating leftovers all week. A ribeye roast is a company meal. But do you really want to cook 5-10 plus pounds of meat if you have a smaller household? I will first confess, ribeye roast is just one of the cuts of meat I generally pass over. It is not a cut I grew up eating and if I want fancier, I tend to go to steak or a filet. But I do an occasional prime rib at a restaurant but frequently put off by the amount of fat. And lastly, it is just the wrong size for our home needs. So it was time to make it friendly for the smaller household. 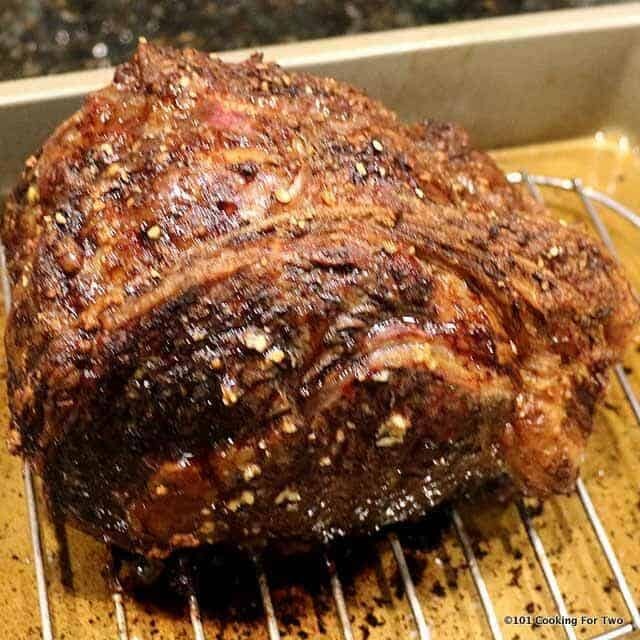 This is a very nice roast with great taste and fork tender. A nice 5. There is some confusion about prime rib vs.ribeyee. First “prime rib” is more of a marketing term. 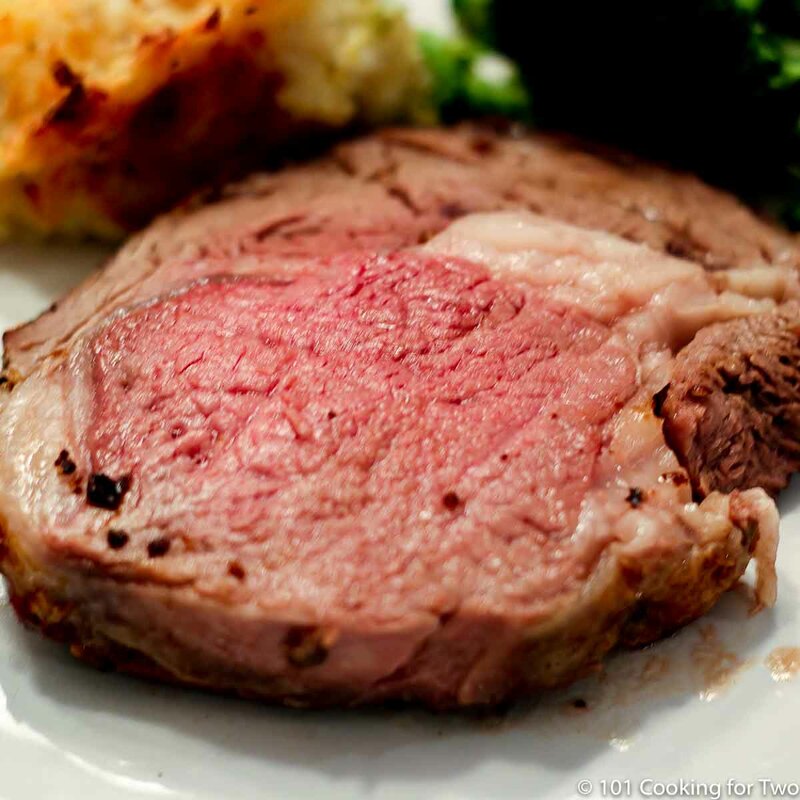 What we think of as prime rib is generally a rib-in standing rib roast. It does not need to be prime grade but will usually be choice grade. 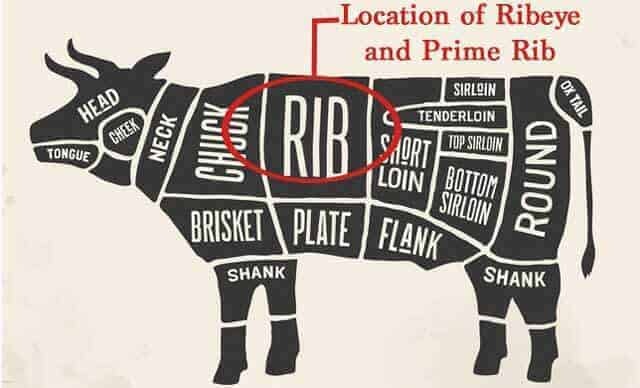 I also want to mention that a ribeye is not an “eye of round.” Eye of round is from the “round” area in the diagram above near the tail area. It is lean but can use a similar cooking technique. If you have a rib steak (prime rib steak) then the rib bone is left intact. But in a bone-in ribeye steak, rib bone will be cut through in the interest of consistent thickness. But mostly ribeye steaks in the US are boneless. If bone-in ribeye steak in the US, it will usually be called a cowboy steak or cowboy ribeye. This is usually cut 2 inches or thicker. So in summary, ribeye is not prime rib, while prime rib does contains the ribeye. A prime rib may not be prime graded although I think it should be, so ask. 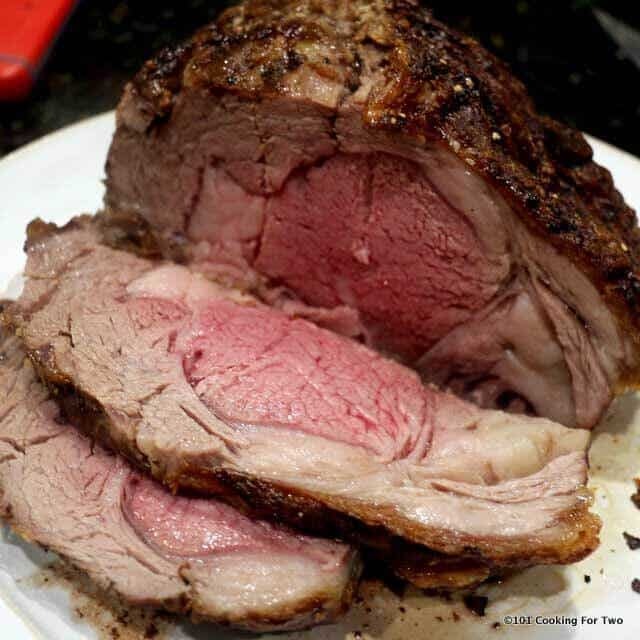 Roast with rib may be called “prime rib” or standing rib roast. In the US basically, things labeled ribeye will will almost always be boneless. Now you are educated or very confused. I used an Allrecipes.com recipe for inspiration but had some changes. Most significant is the decrease in butter. Due to the initial searing temperature of 500 degrees, that amount of butter is just going to melt off and smoke. So you have some choices about if this smokes too much for you. You can just realize it will probably happen and live with it. You can eliminate the butter and use a higher temperature vegetable oil which still may smoke some. You could add some water to the pan under the rack, so when the butter melts off, it hits the water (max temp of 212) instead of the 500-degree pan. Preheat oven to 500 degrees and lower a rack so the roast will be in the middle of the oven. Mix 3 tablespoon of softened butter with 3 cloves of crushed garlic. Poke a 15-20 half inch knife holes into the roast. Slather the butter/garlic mixture onto the roast pushing some of the mixture into the holes. Add some salt and pepper to the roast. Prep a roasting pan with a rack and give the rack a heavy coat of PAM. A cake pan is good here. The pan needs some sides to prevent splatter. Place fat side up on the rack and into a 500-degree oven for 20 minutes then decrease the temperature of the oven to 325 degrees and continue to roast until desired internal temperature. For my 2 1/2 pound roast, an additional 45 minutes for 130 degrees, 55 minutes for 140 and 60 minutes for 145. But when I used roast slightly over 3 pounds, it added 30 minutes to the cooking time. Never cook by time alone. Always check with a meat thermometer. Tent lightly with foil and allow to rest for 15-20 minutes before cutting. Remember the roast may increase a few degrees when tented. 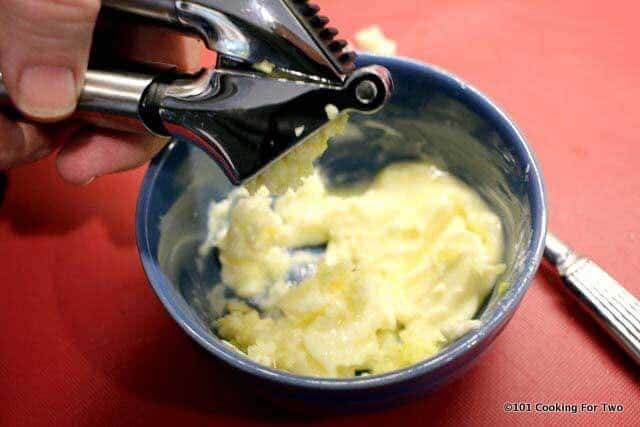 Mix 3 tablespoon of softened butter with 3 cloves of crushed or minced garlic. Poke a 15-20 half inch knife holes into the roast. Slather the butter/garlic mixture onto the roast pushing some of the mixture into the holes. Add some salt and pepper to the roast to taste. Prep a roasting pan with a rack and give the rack a heavy coat of PAM. A cake pan is good here. The pan needs some sides to prevent splatter. Place on rack fat side up and into a 500-degree oven for 20 minutes then decrease the temperature of the oven to 325 degrees and continue to roast until desired internal temperature. Place fat side up on the rack and into a 500-degree oven for 20 minutes then decrease the temperature of the oven to 325 degrees and continue to roast until desired internal temperature. For my 2 1/2 pound roast, an additional 45 minutes for 130 degrees, 55 minutes for 140 and 60 minutes for 145. But when I used roast slightly over 3 pounds, it added 30 minutes to the cooking time. Never cook by time alone. Always check with a meat thermometer. Your time may vary. Tent lightly with foil and allow to rest for 15-20 minutes before cutting. Remember the roast will increase in temperature a few degrees when tented. You will probably have some smoking from the oven due to the butter and the high temperature to start. So you have some choices. You can just realize it will probably happen and live with it. 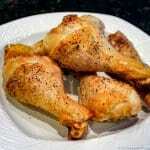 You can eliminate the butter and use a higher temperature vegetable oil which still may smoke some. You could add some water to the pan under the rack so when the butter melts off, it hits the water . (max temp of 212) instead of the 500 degree pan. I’m so happy to find cooking times for smaller roast! Thank you! My question is related to the butter. My daughter is dairy intolerant so I’m looking for a replacement even though I would absolutely love the butter! With the smoking issue oh, I suppose olive oil would not be a good replacement. I do have grape seed oil, canola oil, coconut oil and regular vegetable oil. What would you suggest as a replacement for the butter? I would tend to use canola oil since I know it is neutral. Grape seed oil, which is “neutral”, seems to have a bit of taste to me. Getting ready to do a ribeye roast and just fired up the oven to preheat. The roast weighs just over 2 lbs for myself,wife and daughter. I will be using the beef broth method and put on a nice rub after letting it set out for a while. Did not read far enough regarding the “smoke” part :) Turns out our smoke alarm system is working as intended :) Now waiting to finish cooking…. There is a suggestion a few days ago by Frances to use a can of beef broth in the bottom and it can be used for au jus later. I really like that suggestion. Thanks so much for the note. Maybe a few others will take note. Purchased a 2.63 lb. roast to cook on New Year’s Day. Haven’t done one in years so needed a recipe for a small roast for two. Was I ever glad that I found your recipe! Was a little anxious about a 500 degree oven and smoke from the melting butter. However, as the roast cooked there was no smoke (put about a half cup of water in bottom of pan) and after 20 mins at 500 degrees in my gas oven, the roast was beautifully browned. Turned oven down to 325 degrees and inserted meat thermometer and cooked another 65 mins until roast reached a temperature of 135 degrees. Another 65 mins. seems too long for this size roast but it turned out medium rare. Perfection! Your recipe definitely rates five stars. Thank you so much! Thanks so much for the detailed report for others to read and thanks for the note. I added a can of beef broth and some sliced mushrooms to the bottom of the pan which eliminates the smoking butter and makes a lovely au jus to serve with the roast or thicken for gravy. This roasting method worked perfectly! thank you! Made this for Christmas eve dinner and it was so tasty! Had a 2.5 lb bone-in rib roast. Salted in the a.m. for about 6 hours in the fridge. Let sit at room temperature for an hour after poking with knife and coating in butter. 20 minutes at 500 degrees (with water in pan under rack) then 325°F for 60 minutes. Yummy! Welcome to the blog. Sorry for the delayed response. Glad it worked well for you and thanks for the note. Rare is definitely should be fairly easy. I like to use a remote thermometer if I’m aiming for rare so I don’t over do it by accident. Hope it worked well for you and thanks for the note. This is a wonderful recipe. I will surely make it again and again. Thanks for the note and hope you had a great holiday. Did you take the meat out of the fridge and let it come to room temp before cooking? Excited to try your recipe today! Resting to room temperature is not really needed here. If you want “well done” (and nobody does) then resting at room temp for 30 minutes would be helpful in obtaining the final internal temperature. Thank you! The rarer the better for us! Thanks for your prompt response! Merry Christmas! Hey, I am so happy that I found your recipe again. It’s been a year since I used it last and it took about 45 minutes surfing to find it this morning. While my riast is much bigger this year, I’m confident I can adjust. Definitely going to bookmark the page this time. Merry Christmas! 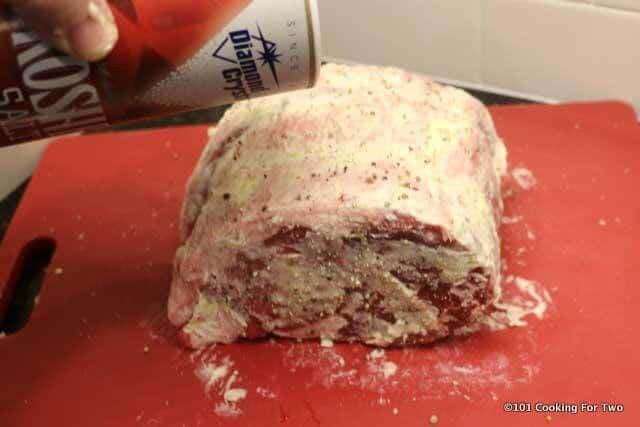 Just throwing this put there as a helpful tip, if you ask your butcher for a rib roast closer the the strip side then the chuck side you won’t have that knot of fat in the middle of your roast. Thanks for the tip. I believe it is also more marbled. So good in every way. Happy Holiday and thanks for the note. Hi—-was that coventional 500 or convection? I have an electric oven ( dislike it very much, but in Fl and unless running my own gas line…..) and things don’t seem to crisp too well without convection. Planning on making a small roast for Christmas. Btw: love your recipes. The seared strip steak one of my favs. That is 500 degrees conventional not convection. Watch for the smoking issues. 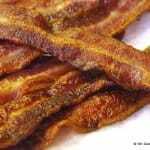 If you are not used to high-temperature ovens, take it up to 500 degrees before the big day to see if it smokes. What do you use, or what do you suggest for au jus/gravy? Recipes? For a clear au jus, I would use 2 cups of a good beef broth/stock to the drippings assuming there is not a lot of fat. You can use a fat separator if needed. Add a teaspoon of soy sauce to pop the beef taste some and add salt and pepper to taste. Be careful with the salt since the soy sauce is high in sodium. Some people want more of a gravy. 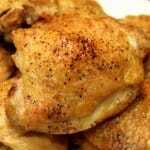 See https://www.101cookingfortwo.com/how-to-make-gravy-101/ for two methods. I do enjoy beef above other meats but cooking a beef roast of any kind is problematic for me. I enjoy my beef at medium rare. Even medium isn’t an enjoyable taste of beef. My wife is the opposite, no red at all, or she won’t eat it, well done or none. I don’t want to waste a good rib roast by either over or under cooking, so I don’t cook them. 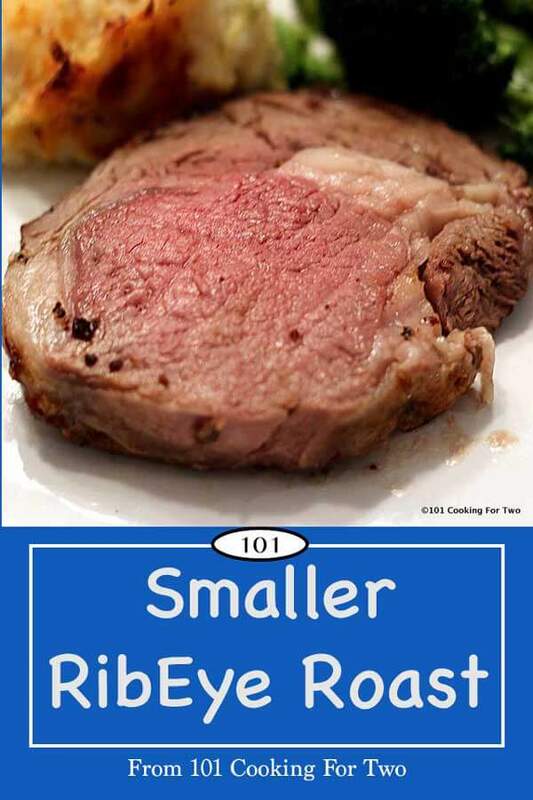 What I’m thinking of trying is to cook a rib roast to medium rare then after resting, slice her portion, return that portion to the oven until it reaches her desired well done. I had a similar but not quite as severe problem yrs ago for large holiday meals. My solution at that time was to cook whole large beef tenderloins. The ends, and several inches in, were medium then tapered down to medium rare. But that was a big piece of meat. The key was to cook at high temps but not too long. The ends and outside of the middle cooked but the middle not so much. This will work somewhat with this smaller rib roast but not as well. Your plan to cook her portion after cutting will “work” but the issues I see are you will lose a lot of juices. So her’s will be dry. And you will be eating at totally different times. But considering how far apart your tastes are, I would suggest rib eye steaks or filets. You can control the cooking much easier with better results for both of you. Sensational! First time I tried a bone in ribeye roast and your instructions were spot on. I started with 450 oven, added water to just cover roasting pan, after 20 min. reduced to 325 for 45 min – came out a perfect medium rare. I was nervous because the roast was only 2 1/4 pounds. I also appreciated all the information you provided about the cut of beef and the “difference” between prime rib and ribeye. Many thanks! It’s a keeper. Glad it worked so well for you and thanks for the note. You start at 500 then decrease to the oven temp to 325. The part you are referring to is about the final internal temperature you want. So to get to 145-degree internal temp it takes about 60 minutes more but as always, times are provided for estimates, cook to the final internal temperature you want. I don’t have real butter. Would margarine do?? It will “work” but not be as good. Considering what you paid for the ribeye, spring for the butter. I keep this recipe bookmarked. It never fails. I do start it a little cooler (450) and then lower the temp as directed. This seems to keep the smoke down and it still gets nice and browned and crispy on the outside. I use a probe thermometer with a beeper, so when it hits 128, I’m alerted. This way, I can do any size roast and let the thermometer do the work! Thanks for the great recipe. I do love my remote thermometer. Thanks for the suggestion and the note. Excellent! I had a 2.3 lb standing rib roast. I chewed on the bone as soon as it rested. Sooo good. How can you lose with that much beef and butter? Glad they are working well for you and you solved your oven issue at least for this meal. I’m a little surprised you had no smoke. Thanks for the advice, may bring roast & cook at friends house. Now, this is a total guess on my part. I would set up the grill like the chicken then sear for 5 minutes per side on the hot side then put it the indirect side fat side up. Probably rotate after about 30 minutes. Then watch the internal temperature. Now realize I have not done this or any beef like this but I was planning a Tri-Tip roast and this is what I had in my mind to do. It may or may not work well. It is your expensive meat and a company meal we are talking about. How do they feel about Pizza if it doesn’t work… You may want to Google for somebody who as actually done this. You’re killing me! The roast looks delicious! Say what? I’ve just developed a serious allergy to beef – my favorite special occasion treat. Have you ever heard of this? In over 40 yrs in medicine, I have never had one but it is not impossible. Be sure you are seeing a board-certified allergist for confirmation. Food allergies are very tricky to be accurate about and there are lots of newer things the allergist can do. 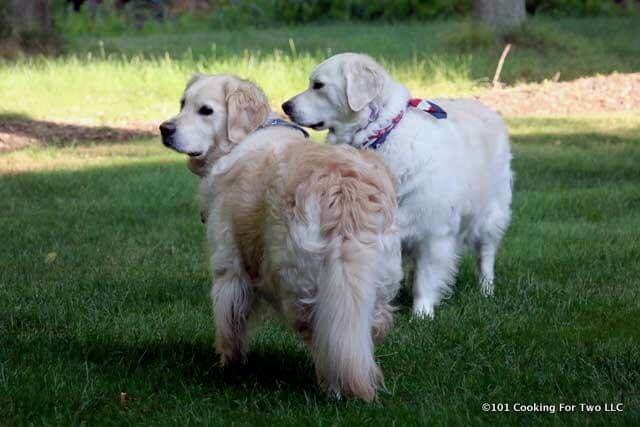 I have heard of sudden red meat allergies being caused by a kind of tick bite. Might be worth asking for testing. Best of luck. We have made this cut of roast on a rotisserie over a gas grill. Outstandingly delicious! !